This image shows a supermassive black hole, a black hole with a mass several hundred or thousand times greater than our own sun. Many galaxies, including or own, have a supermassive black hole in the middle, that can even swallow stars that get too close. 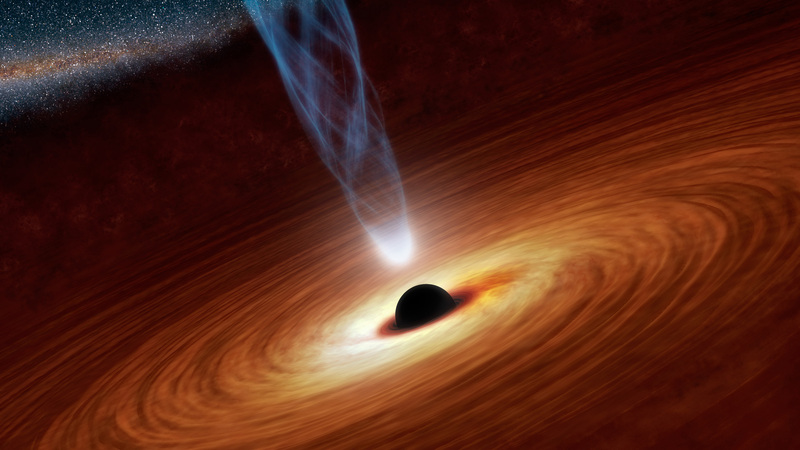 Around a supermassive black hole a large disc of matter rotates, in the process of being pulled into the black hole by its enormous gravitational forces. While this matter is being torn apart at the atomic level by the extreme gravity, a great amount of radiation escapes. This shoots out in the form of two brilliant beams from the black hole. But inside a black hole, the laws of physics as we know them do not apply. As the cosmic image of the inevitable and unknown, black holes made their way into Not Dark Yet. Not Dark Yet will be published by Two Dollar Radio in November and can be preordered here.